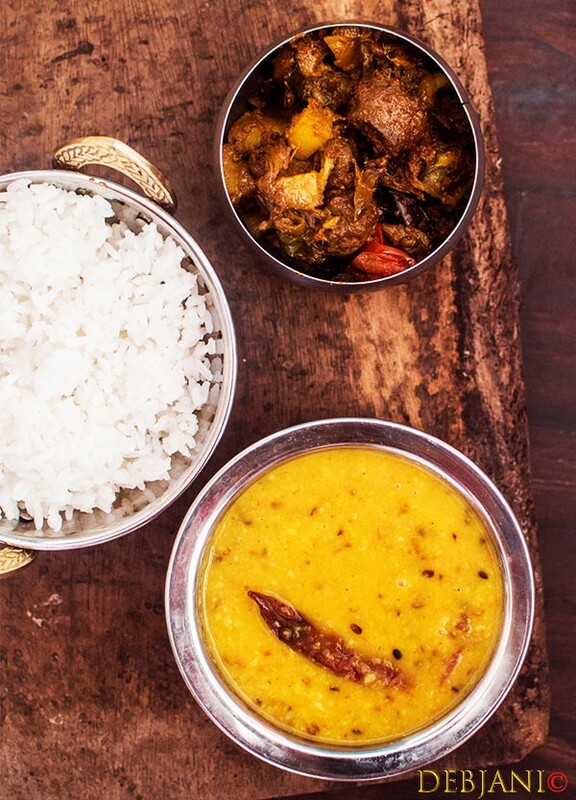 Bhaja Moong er Dal is a Typical Bengali delicacy prepared almost in every Bengali Households. This Daal is a Bong version of Lentil Soup prepared no Onion and no Garlic. 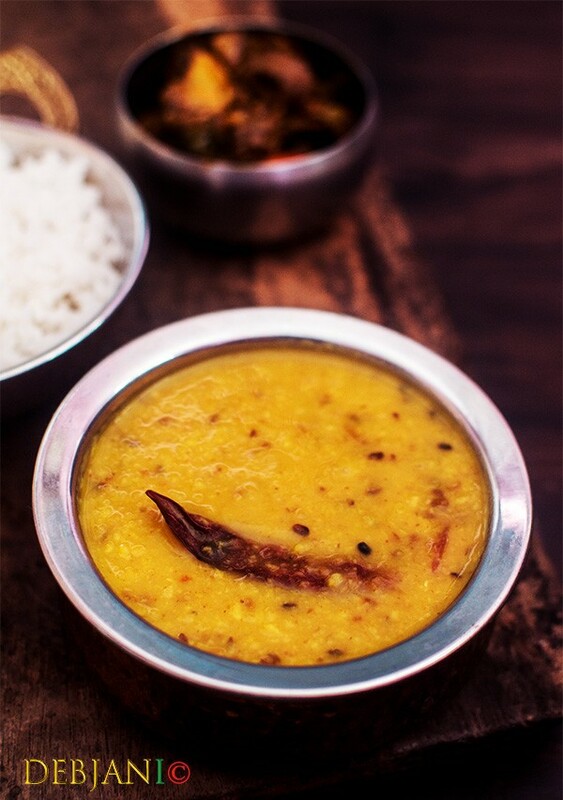 Bhaja refers to “Fried” however this Daal is prepared with dry roasted Moong Daal, in fact, the special aroma of dry roasted Daal is the significant characteristic of this Daal. Dida used to call it Sona Muger Dal. Sona Mug is actually a variety of Moong Dal available in West Bengal and in the stores, those are having Bengali section within or outside India. Bhaja Moong er Daal is all about the comfort, the sweet taste and the after-taste of Ghee. 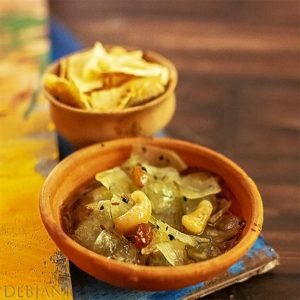 A soothing Bengali Side it is for a few spoonfuls of rice. The recipe of Bhaja Moong er Daal calls for very basic things apart from the Yellow split lentil. You need a few spices such as red chili, cumin seed and powder, bay leaf and some ginger paste to make the Daal. Ghee is an integral part of this delicacy. Though optional, however, I like tomatoes in my Sona Muger Dal. Last but not the least, green chilis not only givens the hotness but required for the distinct aroma as well! Bhaja Moong er Daal aka Sona Muger Daal is a no onion no garlic comforting Lentil soup from Bengali Cuisine. Take Moong Daal in a Non-stick pan and dry roast over medium to medium-low heat 1-2 minutes or till the dal changed to a golden color but not brown and emit a nutty aroma. Switch the flame off and Transfer dal to a bowl and wash daal thoroughly. Now boil dal along with the turmeric powder, 1 whole chili, and salt till it softens in a pan with a lid on for 20 minutes. Else simply use a pressure cook the same which requires 3 whistles. I mostly opt for a Pressure cooker for this step. Heat ghee in a Pan and temper the Ghee with Dried Red Chili, Bay leaf, and Cumin Seeds and fry for a ½ minute. Add little water and cook till the water evaporates. Add Ginger Paste and fry for ½ minute more. Now add chopped tomatoes (optional) and stir constantly. Add Salt, Sugar, Cumin Powder, ad slit Green Chili to the mixture and cook for 1 minute. Pour boiled dal into the mixture and mix well. Cook in medium flame for 5 more minutes & remove from heat. Add little Ghee to fish the dish. Serve Bhaja Muger Dal with Plain Rice along with Begun Bhaja or any other veg or non-veg side dishes. Tomatoes are optional however I prefer mine with it. You can skip the cumin powder as well. You can top it with a few cilantro as well. Ghee can be substituted with Oil, however, that will not give the richness and aroma to the Daal. I personally love to have Bhaja Moong er Daal along with Aloo Phulkopir Dalna as an accomplishment for plain rice. At times I serve it with Chorchori as well. Then there are times when humble Aloo Bhaja or Aloo Bhate is more than enough. 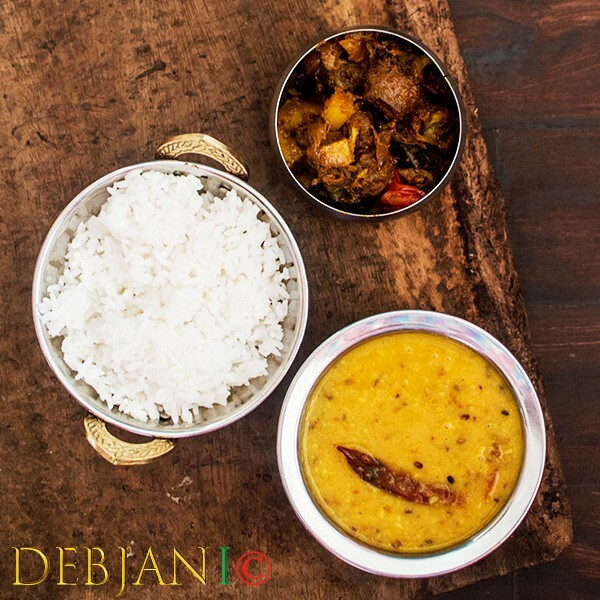 Have you tried the Bhaja Moong er Daal/ Sona Muger Dal Recipe from Debjanir Rannachar!